Apple Inc. has come a long way since the fat computer monitor with a rainbow-colored apple logo imprinted on it. But, so have other companies. Apple Inc. is in considerable competition, even with it’s notorious and commonly purhased product, the iPhone 4. As you use the iPhone 4, the device may store personal info and other data. Luckily, an iPhone 4 allows you to erase data. This includes apps. Whether you want to get rid of certain applications, have a clean start to your iPhone 4, or prepare the device for selling, getting rid of data can be done and is a simple task. Press on the “settings” icon at the main screen. Then, scroll down until you see a “general” tab. Press the general tab and scroll all the way down to access the “reset” option button. You’ll be taken to a menu of options, one of which is the “Erase All Content and Settings” option. Press on this tab. Input your 4-digit password key afterwards if necessary. 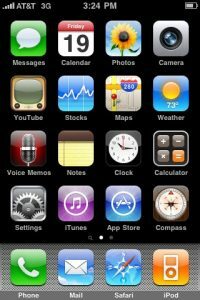 A prompt will appear at the bottom of the screen, asking you to confirm that you want to erase everything on the iPhone 4. Select “Erase iPhone” and leave the device alone so it can perform the task. Ensure that you have the latest version of iTunes before backing up data.